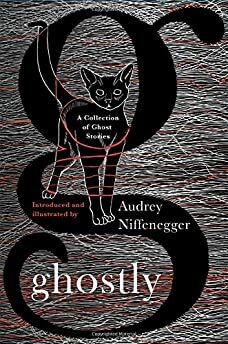 Largehearted Boy: Book Notes - Audrey Niffenegger "Ghostly"
Book Notes - Audrey Niffenegger "Ghostly"
Ghostly, edited by Audrey Niffenegger, is an eclectic collection of ghost stories from Edgar Allan Poe, P.G. Wodehouse, Kelly Link, Neil Gaiman, and others. This is a playlist for Ghostly, an anthology of ghost stories I edited and illustrated. All of the stories feature houses, lovers, children or cats: things that are frequently haunted. The stories are not especially grotesque or frightening. They are quiet and they linger, as good ghosts should. This is a genuinely spooky song to go with a story of a man's cruelty to animals and women. "If one black cat don't cross me, another black cat will," pretty much sums it up. A song of insouciant, affectionate lovecats, to go with a house full of deceased but very loving cats. "We missed you, hissed the lovecats..."
In the story, a second wife is discomfitted to discover that her husband is receiving letters from his dead first wife. As one does. This is one of those Turn of the Screw-type stories that can be read in two somewhat contradictory ways: is the protagonist crazy or is his lovely apartment haunted? Either way, he's not very kind to his lady friend, poor thing. These are two ghost stories that are funny and frightening, both very English, but only one of them has jokes about playing golf. I was delighted to discover this Wodehouse story of a hardboiled thriller writer whose romance-writing aunt dies and leaves him her seriously girlishly lovely cottage, in which everything he writes becomes infested with sentiment. And nothing is less sentimental than Screamin' Jay Hawkins. You could use this song to exorcise Honeysuckle Cottage, but then there would be no story. Most of this story takes place whilst the two characters are slowly ascending a staircase in a large dark house. And it's a properly atmospheric song, sweetly chilling, like a child's hand clutching yours in the dark. This story is sad and entirely without irony, a story of lost children by a man who had lost his child. The story is sunlit and wistful, the song is winterish and wary, but they are both weighed down by early loss. This is a strangely cheerful story about a girl whose imaginary friends turn out to be less imaginary than her guardian imagines. The Beatles cajole Prudence to come out and play; in Playmates no one needs any encouragement, it's all very congenial. "The spirit is willing but I don't believe in miracles." A boy ghost anxiously hangs around the house his mother still lives in, hoping to somehow return to her. Unfortunately, she doesn't know he's there, and her lodger isn't being very helpful, though he understands the problem. A story of vengeful reincarnation and otters. I am confident that John Lennon would have been a Saki fan, they share an appreciation of the absurd. Two tales of girls who need no further encouragement. A spooky, delicate song to compliment the greatest spooky babysitter story ever written. This story was my favorite find; it has not been previously published and it is marvelously quirky. A house is invaded by miniature ghosts, it looks as though they will never leave, and then the humans defeat the ghosts by exploiting their one really weird weakness. The Pink House is somehow Lorenz Hart's lyrics in another form, the one echoes the other strongly. In The Pink House a woman doesn't realize she's being haunted until things have become way too intimate; "horizontally speaking, he's at his very best." A mechanical house in a future war-ravaged city goes through the motions of its day, long after its humans have ceased to require its services. This is not strictly a ghost story, but it is haunted by lost chances and pointless luxury. "Things are going great, and they're only getting better..."